As far as they extend to the CCTV cameras installed by Toronto Police, the weight of those “benefits” is certainly up for debate. Unsurprisingly, the Toronto Public Space Committee has been one of the more vocal organizations advocating for the cameras’ removal, going so far as to stage a mock murder in front of one this weekend. As either a deterrent or an aide in punishment, the TPSC argues that the cameras are “almost completely ineffective,” and it’s certainly tempting to agree. At best, the cameras don’t seem to be really doing anything much other than serving as an extra pair of eyes on the street; at worst, they’re useless ugly boxes that serve to do little more than violate privacy and waste money. In addition to the cameras being installed at specific locations on a more permanent basis (like the entertainment district, Jane and Finch, and so on), the boxes have also started discretely popping up to keep watch over specific high-attendance events. 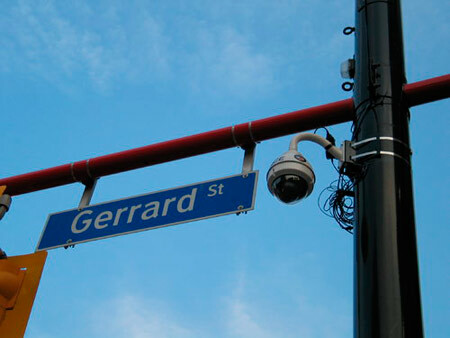 Police CCTV cameras recorded last year’s Taste of the Danforth, International AIDS Conference, and Molson Indy––and, earlier this month, without notice or explanation, they appeared along Yonge Street. When Daniel Quinn of the TPSC contacted a police spokesperson, he was told that the cameras were up as a “temporary measure for Caribana,” and that they were supposed to come down after the festival. Arguments about the safety of the cherry-picked events aside, it’s not even the cameras’ temporary appearance along Yonge that is the biggest problem; it’s that, as of yet, they haven’t disappeared. Some two and a half weeks after Caribana’s final parade, the cameras are still there, dotting Yonge Street at College, Gerrard (pictured), Gould, and Dundas. 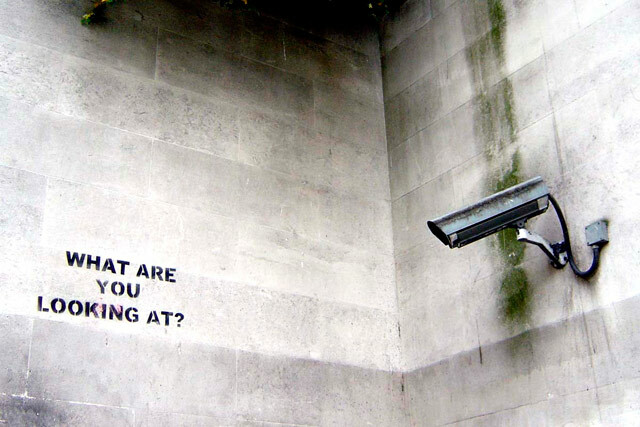 Top photo, of a Banksy stencil at Marble Arch in London by one of that city’s security cameras, by nolifebeforecoffee. Bottom photo by Daniel Quinn.